I grew up in the ‘80s, and am happy to see how some of the fun ‘in’ things from that era are making a comeback, such as the Brat Pack movies – my favorites are ‘The Breakfast Club’ and ‘Weird Science’ - and certain clothing styles and colors (neon, anyone?). 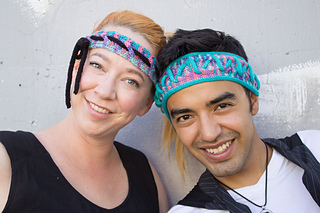 One of my favorite ‘80s accessories is the headband – keeps your ears and forehead warm without mussing up your hair or resulting in a too hot head. When I was little, I thought that the braided kind were the coolest ever, but most of those weren’t wide enough to actually cover the ears – so I came up with a version where you can either go John Travolta or Jane Fonda all the way, or make a wider one that still sticks to the general idea, but is a little more practical; and I can totally imagine the kids from the Brat Pack wearing them all the time. 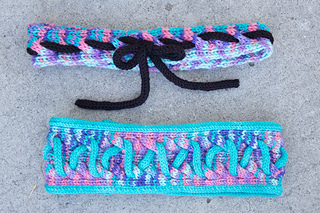 The headbands are a great first cable and I-cord project and can be knit by any confident beginner – if you have an I-cord machine, it will be a super-quick knit to boot! Either version does not require much yarn, and you can make them either all in one color or use a contrast for the I-cords. 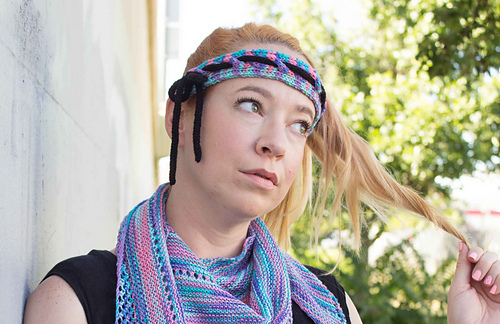 The yarn used here is the limited edition ‘80s Prom-inspired ‘Brat Pack’ color by Lorna’s Laces in Shepherd Sport; but any fun sport bits from your stash will work just as well. Check out the Brat Pack Collection for other accessories to make a whole set!